Camshaft adjuster control valve removal tool – No.T10352. Camshaft adjuster control valve removal tool – No.T10352/1. Crankshaft pulley holding tool – No.T10355. WARNING: Crankshaft sprocket not keyed to crankshaft. Refit crankshaft pulley bolt with spacer. Remove inlet camshaft adjuster control valve (LH thread)  . Remove exhaust camshaft sprocket bolt and washer  . Remove camshaft support bracket  . Ensure coloured or painted chain links aligned with timing mark on each camshaft sprocket  . Ensure balancer shaft timing marks aligned  . Ensure balancer shaft gear timing marks aligned  . 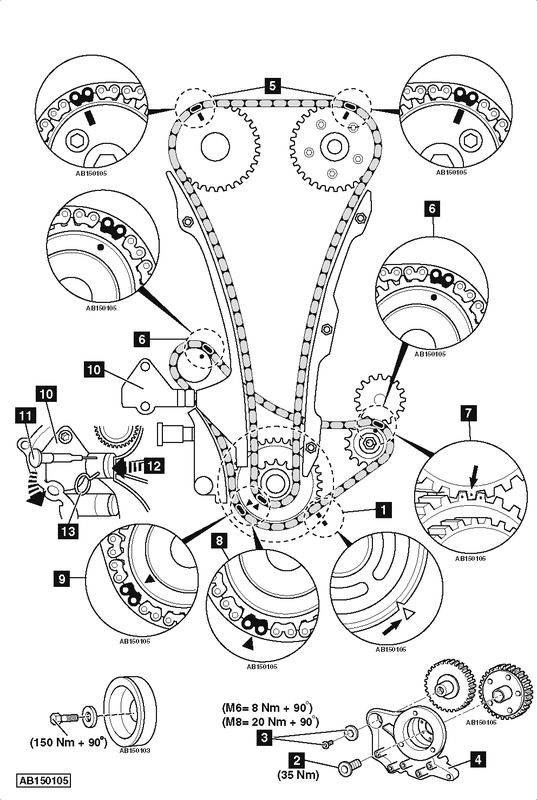 Ensure crankshaft sprocket timing marks aligned  &  . Release locking mechanism using a suitable tool  . Tighten exhaust camshaft sprocket bolt  . may we have directions on knowing how to exactly do them instead of the pictures of the parts? Thank you.